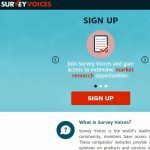 “Survey Voices”, by Reward Zone USA LLC and found at surveyvoicesusa.com, is a get paid to take surveys website that works as a portal for third party market research companies needing consumers’ opinions. They claim they’re the world’s top aggregator website, that they fully screen those with whom they do business, and that you can make $300 on your first time. However, you would be lucky to do so in a few months or so. That is because they do not really offer much in the way of actual paying surveys. In the few days we tested Survey Voices, the first “surveys” weren’t surveys at all, but questionnaires that led to nothing in the way of rewards, cash or points. In fact, they just led to other 3rd party survey websites to try out, and you have to join those to take their surveys. Some were free, some weren’t. While there are some survey companies they redirect you to that are somewhat legit, there are a lot more that aren’t. Besides, those that don’t show up immediately, so if there are decent ones, they’re pretty much buried. While it is free to join Survey Voices, there is nothing in it worth signing up for. You can find every one of the survey sites they lead you to on your own, if you haven’t already. Truthfully, no one ever really makes much money taking surveys. It is more like a hobby – like sedoku or doing crosswords, or something else that you’d do to waste time for fun. The time it takes to make anything below par is so long that it’s an insult to your valuable time and efforts to even try. This site was very disappointing because there are far more scam sites than paid survey sites. Furthermore none of the surveys on the site ever seemed to end, unless they disqualified you halfway through, which by then they have gathered enough info out of you without having to pay for your time. The next disappointment comes when they ask way too much information upon registering than you should give sites like this, especially since it still isn’t an actual paid surveys site. At the risk of repeating myself, the pay out on anything you find on Survey Voices is so sub-par for those who go at them that it’s even more tragic that their info and data will be sold out to 3rd party clients, where they make their real money. The result of that is a mountain of endless spam in your email inbox, not to mention the spam box, too. Be very cautious about clicking on any of it. The one thing I could find almost redeemable is that they have some support, but I’ve had no use for it yet to date. Do not click on any of the sponsored ads, as most of them, if not all, will lead you to scams that will rip you off. You really have no need for anything like this in the surveys world. Just do good research, read the reviews here for decent ones, and just be careful. Many over promise and under-deliver, and a lot of them are just outright scams. I can’t call Survey Voices a scam because they at least don’t charge you to join but it is still not very honest. As a company that claims they are the top paid surveys middleman, they fail to do so in a safe manner, and that makes them not recommended in our book. Besides, trying to get paid to take surveys is no way to earn any kind of income through online work from home business opportunities. Where is the money? Where is the money? Where is the money servey voices is it just a scam?